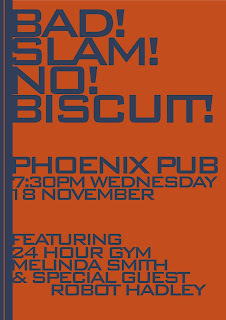 BAD!SLAM!NO!BISCUIT! RETURNS FOR ITS ONE AND ONLY NOVEMBER EDITION FOR 2015. BECAUSE BAD!SLAM!NO!BISCUIT! IS THE POETRY SLAM. The largest, longest running and most extra-terrestrial poetry slam across all space and time. AND THAT MEANS BAD!SLAM!NO!BISCUIT! WANTS YOU FOR TWO MINUTES ON STAGE WITH NO PROPS NO MUSIC AND YOUR ORIGINAL MATERIAL FOR PRIZES AND GLORY AND INFAMY AND LOSING AND VICTORY AND LARGENESS AND SMALLNESS AND INTERMEDIATENESS AND DRINKING IN THE PHOENIX PUB. And because this is the poetry slam we have feature acts! 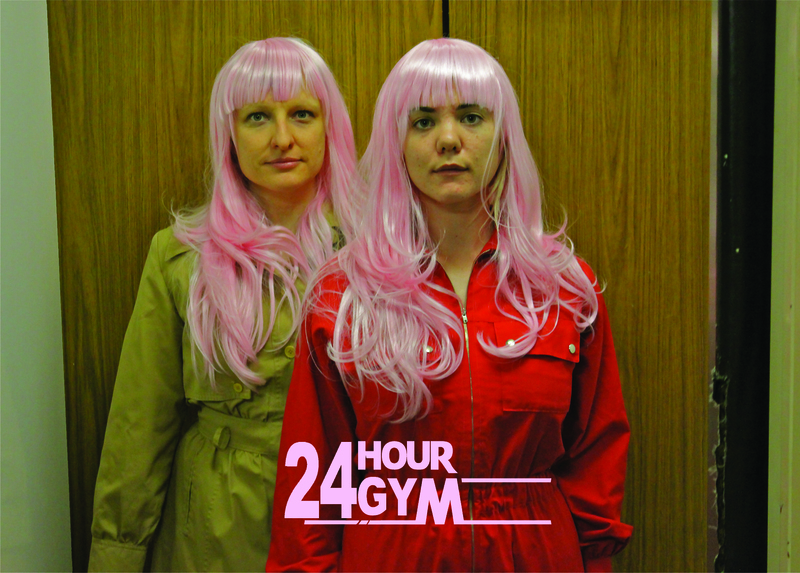 24 Hour Gym is an experimental musical and spoken word project by Pascalle Burton (vocals, synths) and Tessa Rose (vocals, breath). It is music for a complete workout of body and mind, with lyrics derived from both art criticism essays by women (for example, Cindy Sherman, Chris Kraus, Kim Gordon and Meredith Monk), and exercise videos. And filling the Hadley (RIP) Memorial Slots is Special Guest the infamous Brisbane Robot Hadley. Prizes, glory, infamy, poetry, large, medium, negative infinity, space and time! 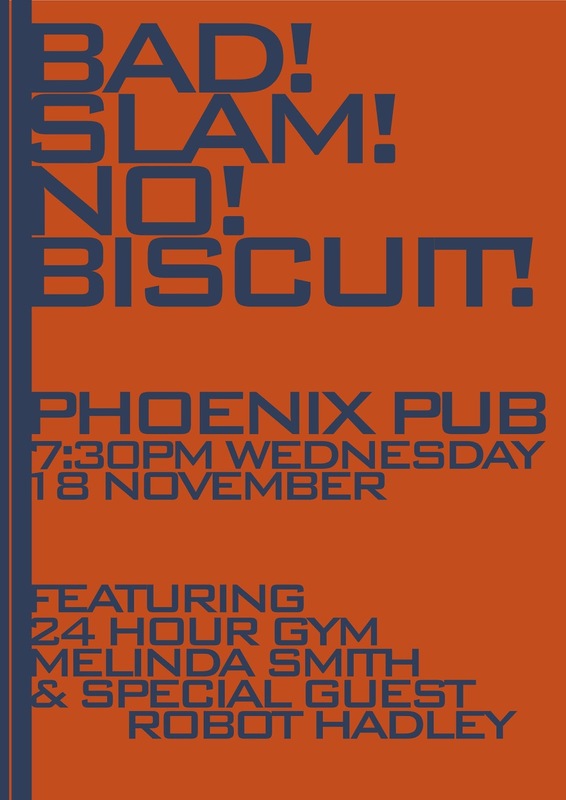 And remember, two minutes, no props, your original material, for prizes, for glory, for poetry, for drinking in the Phoenix Pub.